This jumble of sweetly caramelized tastes and textures is a lovely, albeit unconventional, pasta topper. Truth be told, we like it just as much when you hold the pasta and dump the veggies over cooked couscous or quinoa. Just a thought. 1. Set a rimmed baking sheet or large roasting pan on the middle oven rack and preheat the oven to 500˚F (260˚C). 2. Bring a large pot of water to a boil. In a small dish, combine 1 tablespoon boiling water with the saffron and set aside. Add the salt to the pot. Add the cauliflower, onions, carrots, and squash to the pot and cover until it returns to a boil. Uncover and cook the vegetables for 2 minutes. Using a slotted spoon, transfer the vegetables to a colander to drain, reserving the cooking water. 3. In a large bowl, toss the blanched vegetables with the chickpeas, cherry tomatoes, wine, oil, garlic, cumin, red pepper flakes, thyme, if using, and saffron with its soaking liquid. Transfer the mixture to the hot pan in the oven and roast for 15 minutes, stirring midway through the cooking time, until the vegetables are tender and lightly caramelized. 4. While the vegetables are roasting, return the pot of water to a boil. Add the pasta and cook until al dente. Drain well and transfer to a wide serving bowl. Remove the vegetables from the oven and discard the thyme. Toss the vegetables with the pasta and season with salt and pepper. 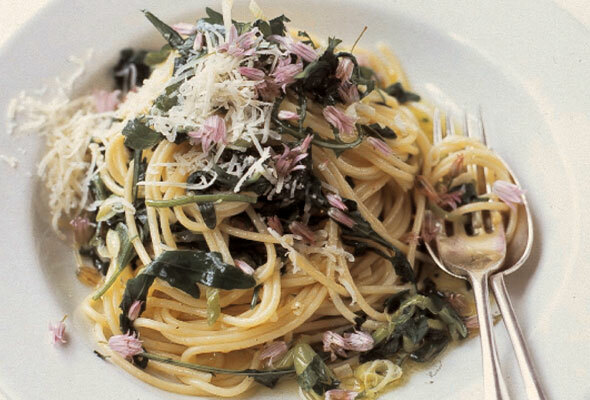 Garnish with Parmesan and parsley, if using, and serve immediately. 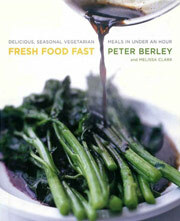 Pasta with Roasted Vegetables Recipe © 2013 Peter Berley. Photo © 2013 Quentin Bacon. All rights reserved. All recipes and photos used with permission of the publisher. Wow! The saffron and cumin give an earthy background to the roasted vegetables, and the roasting sweetens the tomatoes. The wine leaves a nice overtone in the sauce. The amount of pasta was just right for the large amount of vegetables, and although the sauce had absorbed into the pasta by the time we served it, there was no soggy pasta. This is a great vegetarian meal. The weight of my cauliflower was 17 ounces, which was 5 cups small florets. I also used a small butternut squash that gave me 4 cups 1/4-inch-thick half-moons. I used 1 pint grape tomatoes and 1 pint yellow cherry tomatoes. Our choice of wine was a dry Pelee Island pinot. The amount of vegetables required that I roast them on two 11-by-13-inch baking trays that I rotated top to bottom over 30 minutes of roasting. Given the large amount of vegetables, I used 1 pound pasta, cooked al dente. This made enough for 4 dinners and 3 lunches. Good thing, too, as now I’ve something lovely for lunch. The only downside to this recipe is the length of time it takes to prepare and cook. It’s something I’d do any weekend; it’s just too long for a weeknight. What a nice surprise this recipe was! It was really good, lightly spiced, and full of veggies. I used 4 cups cauliflower, which equaled 13 1/2 ounces, and 3 cups sweet potatoes sliced about 1/4 inch thick. The vegetables were only lightly caramelized after 15 minutes so I kept them in a little longer, about 10 minutes more. Then I tossed them with the pasta and topped it with the Parmesan. The cumin was a little strong, so I don’t think it needed a whole tablespoon as it overpowered the saffron. This produced a huge bowl of veggies and pasta that could easily feed 6 to 8. All in all, it was a great-tasting, filling vegetarian recipe. Will make this again and again. This was one of the best meatless pasta dishes I’ve had in a long time. The flavors were very well-balanced, bright, and bursting. The texture of the various vegetables and pasta was silky but with enough bite to be satisfying. If you have a family member or two who will help prep the vegetables, good discussion and fellowship will occur. Plus, there’s the added benefit of sharing a glass of good Chardonnay; you have it open, after all. Sweet potatoes were a fantastic alternative to the squash. My half a large cauliflower head weighed about 1 pound. My sliced sweet potatoes yielded about 2 cups. You need no extra pasta water with the roasted vegetables. There are plenty of juices to cover your penne for a perfect finish. I didn’t use any parchment paper, foil, or oil spray to coat the cookie sheet before placing the vegetables on it, and there were no issues with sticking. I sliced my half-moon sweet potatoes 1/2 inch thick. They were cooked perfectly. There’s no need for any additional salt. The pasta water (where the vegetables are cooked first) is full of flavor. I could’ve eaten the cooked pasta without any sauce at all—it was that good. This recipe works as written, and makes great use of cherry tomatoes. This is a definite keeper. My cauliflower weighed in at 20 ounces. I also used a butternut squash since I couldn’t find any delicata. I cut the squash in half rounds from the top of the squash and skipped using the bottom with the seeds; I had about 1 pound squash and it was plenty. I used the thyme and parsley the first time I made this. The second time I skipped the parsley and it was almost as good, but lacked the freshness, so I’d suggest using it. The second time I made it I was traveling and a package of saffron was $17, so I took a chance and used about 1/4 teaspoon turmeric in its place, which gave the dish a nice color without an overpowering flavor. The key spices in this dish are the cumin and the red pepper. There are lots of options for swapping in various vegetables and pastas. I was reluctant to tell people how easy it was, so I didn’t. They don’t need to know. I was skeptical at first, to be honest. But my taste tester and I really liked the end result. There were a lot of vegetables—really, too many to fit on 1 sheet pan, because if they’re piled together, they’ll steam rather than caramelize. I used the smallest cauliflower from the stand at the farmers’ market. It came out to about 6 1/2 cups. I thought this was a bit too much—5 cups would’ve been sufficient. I thought the carrot could’ve been cut into chunks smaller than 1 inch; half that size seemed more reasonable to me. I used 1 pound delicata squash and cut it 1/4 inch thick. One issue I had with this recipe is that the emphasis is on fresh vegetables—after all, this is more like a bunch of roasted veggies with a bit of pasta thrown in—and that it calls for fresh cherry tomatoes and delicata squash. I don’t know about the rest of the country, but in northern California, when we’re flush with cherry tomatoes, delicata squash is still hard to find. Once the dish was put together, though, we really loved it. And it’s even better left over. The thyme and parsley might be optional, but I really liked the addition of some herbs—really, any herbs you have on hand would be nice. The flavors of this Moroccan-inspired dish are just spectacular. The final verdict is, and I quote my dear friend, swoon, swoon, swoon. I used 1 1/2 pounds cauliflower florets, which translates to about 4 cups florets. I used 1/2 pound butternut squash, cut into half-moons. I didn’t have rigatoni or penne on hand, so I used homemade tagliatelle and increased the amount to 1 pound. I used pecorino Romano instead of Parmesan. This recipe is just a road map, as you can use any vegetables on hand and any kind of pasta, letting your imagination get the better of you. This will definitely be a staple in our home. I’m wildly in love with the vegetables in this recipe. We used about 2 cups each cauliflower, carrots, and sweet potatoes and finished it all off with lots of fresh Italian parsley. I’ll make the recipe again, and will experiment with a version that leaves out the pasta, maybe to serve as a side dish. This was wonderful as lunch the next day, too. I’m a little leery of all the positive comments the ‘testers choice’ folks made–not that there isn’t a good chance that it actually is a 100% positive A-OK kinda dish, but did everyone drink the koolaid first in order to become a tester? Yah, I’m half-kidding here, as I wouldn’t mind being a tester myself, but I guess I’m simply more of the mind that roasted veggies–just on their own–would barely need the extra carbs of pasta. I’d probably toss in a few more carb bomb tubers and eschew the pasta altogether. dontctallmechef, the reason why you see only positive Testers Choice comments is because that is what a Testers Choice comment is: a thumbs up. The recipes you see on the site are but a small fraction of all the recipes we test week in and week out. And it doesn’t do us any good as a curation service to post recipes with negative comments from us. We’d be wasting your time and money and shooting ourselves in the foot. As far as becoming a recipe tester, the waiting list is so long we won’t be opening up to new testers for very long time. But in the meantime eschew away! A few more carb bombs in place of pasta is a great idea. I’d have to toss those veggies with a vinaigrette and put them on an antipasto table. ;) For me, the pasta would be totally unnecessary, or maybe smaller pasta and make it a pasta salad. What can I say? California in the 70s. ;) The veggies look so gorgeous, it would be tempting just to eat them right off the baking sheet. Do you know, David, I was signed up to be one of your testers, way back when, in the very early days of this site? Then life happened, and I had to admit I just didn’t have the time to do it justice. Sort of regretting that now, although I still wouldn’t have the time to test many recipes. Ah, well. Life happens, doesn’t it? Ruthie, well, you’re something just as important: a valued reader. And without readers like you, we’d have no need to test recipes. So thanks for being so loyal all these years.